What is Tangier Disease? Tangier disease is an inherited disorder characterized by significantly reduced levels of high-density lipoprotein (HDL) in the blood. HDL transports cholesterol and certain fats called phospholipids from the body's tissues to the liver, where they are removed from the blood. HDL is often referred to as "good cholesterol" because high levels of this substance reduce the chances of developing heart and blood vessel (cardiovascular) disease. Because people with Tangier disease have very low levels of HDL, they have a moderately increased risk of cardiovascular disease. Additional signs and symptoms of Tangier disease include a slightly elevated amount of fat in the blood (mild hypertriglyceridemia); disturbances in nerve function (neuropathy); and enlarged, orange-colored tonsils. Affected individuals often develop atherosclerosis, which is an accumulation of fatty deposits and scar-like tissue in the lining of the arteries. Other features of this condition may include an enlarged spleen (splenomegaly), an enlarged liver (hepatomegaly), clouding of the clear covering of the eye (corneal clouding), and type 2 diabetes. Sharon Kay III, Crisfield, Md. the Eastern Shore of the Lower Chesapeake Bay at Crisfield, Md. The Joyce Marie II departs Tangier Island for Onancock Virginia on the Eastern Shore of Virginia twice daily. Transportation is seasonal. The Sharon Kay III departs Tangier Island for Crisfield, Md.YEAR ROUND days a week in the late afternoon around 3 or 4 pm depending on what day you depart. 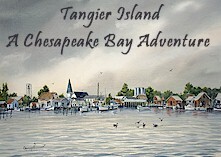 Return trip to Tangier from Crisfield departs at 4 or 5 pm, again, depending on the day you depart. Tangier Disease is an inherited blood disorder involving decreased concentrations of fat compounds in the blood called high-density lipoproteins (HDL) (sometimes called "good cholesterol"). Large amounts of these compounds may accumulate in certain organs of the body causing tissue discoloration. In later stages, these accumulations may cause organ enlargement and/or blood circulation problems. Prevalence Documentation shows that as of 1988, 27 cases of Tangier Disease had been reported and in 1992 the reported cases were still fewer than 50 persons worldwide. 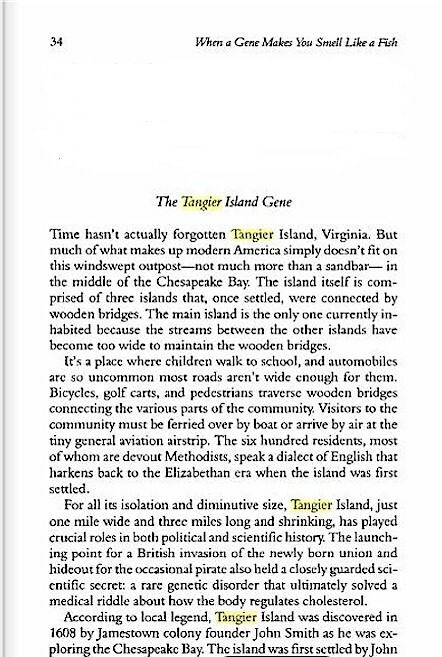 The majority of the cases tend to localize in one single area of the U.S., Tangier Island, Virginia. 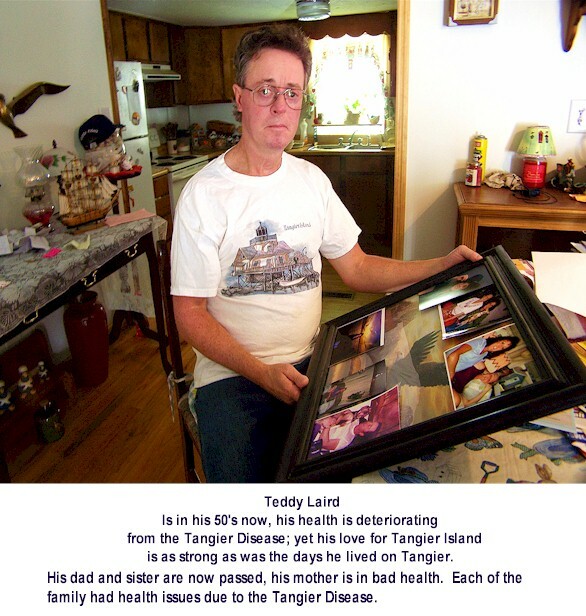 The fact that most of the people that are affected by Tangier disease all live in close proximity to one another could be due to Founder's effect. The original settlers to the island came in 1686 and it is possible that one or two of them were carriers of the disease or actually had the symptoms and passed it down through the blood line. 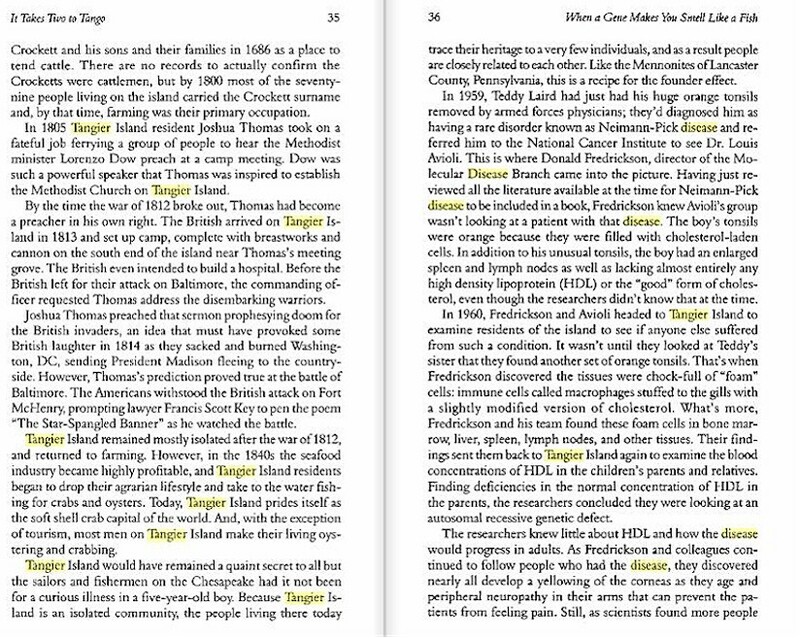 Signs and Symptoms Characteristics of Tangier Disease include increased levels or even a complete absence of high-density lipoproteins (HDL) concentrations in one's plasma, low cholesterol levels in the plasma, increased cholesteryl esters in the tonsils, spleen, liver, skin and lymph nodes. One easily visual characteristic usually found in children with Tangier disease is the presence of enlarged, yellow-orange tonsils. Initial research of Tangier disease showed a marked decrease in the HDL concentrations when compared to normal controls. 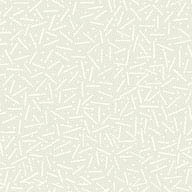 In some cases the reduction was as great as 50%. Scientists studied the HDL concentrations and looked for any possible links in its involvement with the disease. They specifically looked at the apo A-I (apolipoprotein) concentrations, which is a major protein component of HDL. The main hypothesis was that apo A-I was structurally abnormal. Studies proved that this was incorrect because the DNA- derived protein sequence for Tangier apo A-I was identical to the control groups apo A-I sequence. 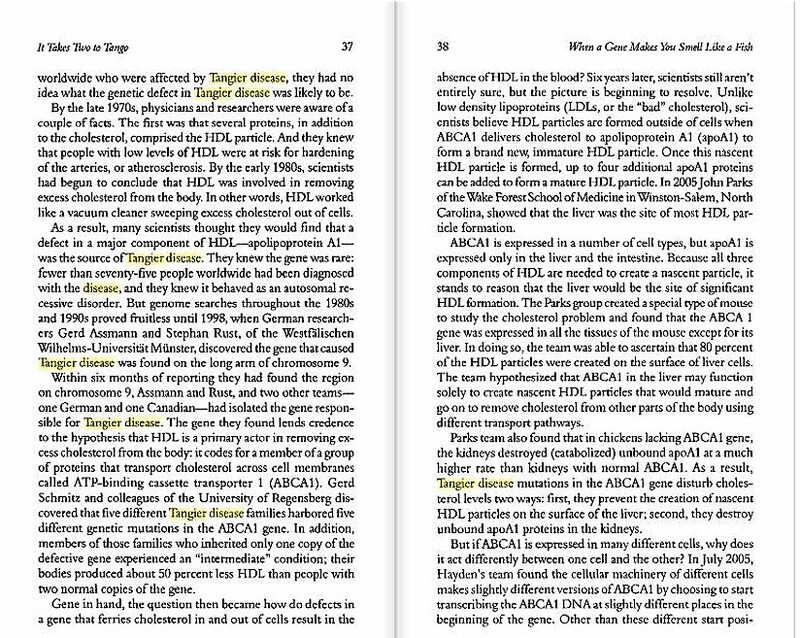 Causes Scientists discovered that the cause of Tangier disease is involved with the intracellular membrane trafficking of the HDL. Normally macrophages inside the cell have receptors that bind the HDL. After the HDL is bound it is transported into the endosomes. The endosome is transported through the cell without any degradation by the lysosome and the HDL is eventually resecreted from the cell. It is during this cycle that there are problems for the Tangier disease people. When the HDL is allowed to bind to the receptor monocyte, the two stick together but they never separate. The HDL is not resecreted outside the cell. 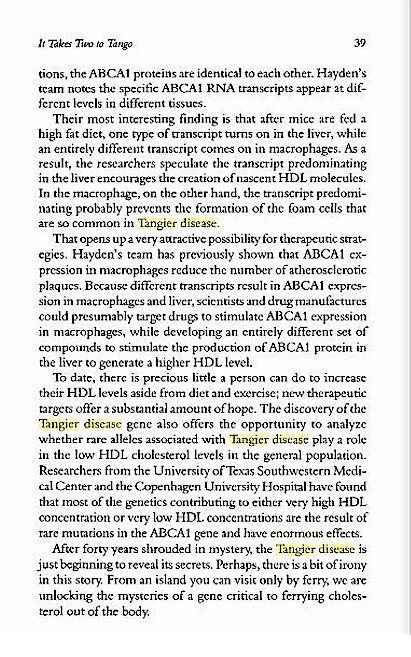 The data suggest that there is a deficiency in the cellular metabolism of HDL in the Tangier monocytes. The HDL-monocyte unit together also supports the observed condition of high concentrations of excess cholesterol in body tissues. 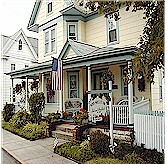 Travel the US East Coast with us.